Age 49 of South Wilmington, passed away Monday April 1, 2019 at the Joliet Area Community Hospice Home. Born October 6, 1969 in Morris, Illinois, Donald Wayne is a son of Donald Duane Harvey and the late Jacquline Sandra (nee Markwell) Harvey. He was raised in Braceville; attended Braceville Grade School and graduated from Mazon High School with the Class of 1988. Following high school Donald went on to attend Universal Mechanical Institute. He worked as a mechanic at Wilmington Ford, as well as at Rub Ford before gaining employment with Stone Container. He was most recently employed as a Baler Operator at WestRock in New Lenox. A collector of vinyl records; Donald also enjoyed drag racing, 80’s rock, detailing his vehicles, roller skating, and old westerns. In his free time he took pleasure in watching re-runs of MASH, building model cars and cooking, smoking and barbequing outdoors. 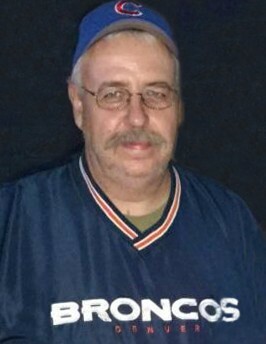 He had a love of the outdoors, cherished his dog Jack, and will be remembered as a fan of the Fighting Illini, the Chicago Cubs, and especially that of the Denver Broncos. Survivors include his wife Kelly, whom he married on October 13, 2007 in Good Shepherd Lutheran Church in Braidwood; one son, Donald “Andrew” Harvey of Champaign; his father Don Harvey of Braceville; his twin sister, Denise Clifford of Morris; niece, Vyvyanne Perino; nephews: Jeffrey Perino and Trent Kingman; aunts and uncles: Hilary (Steve) Hylton of Leiston, England, Richard (Sue) Beckett, Douglas Beckett (Pat Gant) and Malcolm (Val) Markell, all of Ipswich, England, George (Nellie) Harvey of Chame, Panama, James Harvey and John (Denise) Harvey, both of Braceville and Michael Harvey of Alton, Illinois, and numerous cousins. Donald was preceded in death by his mother, Jacquline; grandparents: Hilda and Douglas Beckett and George and Mary Harvey and one uncle, David Beckett. The family will receive friends for a visitation on Sunday, April 7, 2019 between the hours of 2:00 p.m. and 6:00 p.m. at Reeves Funeral Home, 75 North Broadway (one block north of Illinois Route 113) in Coal City. Funeral services will follow Monday morning, April 8, 2019 at 10:00 a.m. in the funeral home. Burial will be in Braceville-Gardner Cemetery, and pallbearers will be: Andrew Harvey, Jeff Perino, Bill Weaver, Andy Castillo, Vyvyanne Perino and Danny Keck. Preferred memorial may be made as gifts in Donald’s memory to the family for their distribution.